Smaller scale instruments have increased in popularity over the past few years, because not only do students seem to be starting younger than ever, but also the easy-to-transport guitar has become recognized as an excellent companion for the weary traveler. From the on-the-go businessperson who needs a guitar that can fit in a plane’s overhead compartment, to the happy wanderer just looking to animate his sojourn with a song, the compact travel guitar can be an uplifting addition to any expedition. The EWP14OPN is a 1/3-size, steel string Piccolo acoustic guitar. 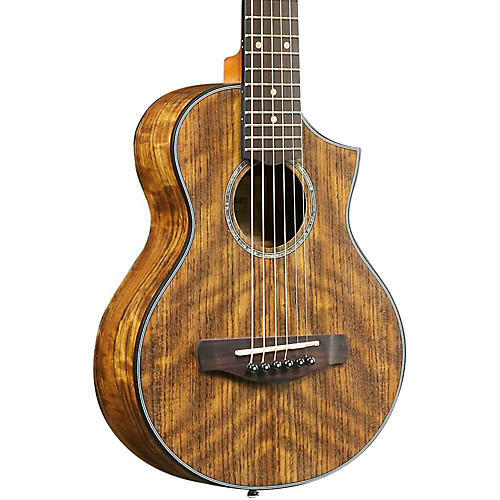 Similar in scale to a Baritone ukulele (17”), the EWP14 sports an EW style cutaway body. The top, back, and sides are made of ovangkol, a wood found in Western Africa, known for its beautiful figuring and rosewood-like tone. An Open Pore Natural finish allows the body to resonate more freely for improved tone and projection. Other features include an abalone rosette, rosewood fretboard, bridge and chrome die-cast tuners. To optimize string tension, intonation, and tone, the EWP14 is tuned in the key of A (A, D, G, C, E, A), up a fourth from standard tuning.